A Muslim organization called “Who is Hussain?” donated 30,000 bottles of water to the Red Cross in Flint, Michigan, on Sunday to help alleviate the water contamination crisis that has gripped the city for months. The donation drive came on the heels of President Obama’s declaration of the situation as a federal state of emergency. Who is Hussain? collected the water after a local campaign collected donations of cases of water bottles and online donations netted funds to purchase additional water. The city of Flint is located approximately one hour away by car from Dearborn, Michigan, the city with the highest population of Muslims by percentage in the United States. According to the 2000 US Census, the population of Dearborn was more than 29 percent Arab. Who is Hussain? was inspired by the story of an early Islamic leader, Imam Hussain ibn Ali, the grandson of Islam’s Prophet Muhammad. Hussain ibn Ali complained early on about growing violence and extremism in the Muslim community, but was brutally killed after being denied water for several days. Adherents of Hussain’s teachings believe that the denial of water under any circumstances is an unconscionable crime, and actively promote water distribution campaigns on a regular basis. On the anniversary of Hussain’s death, they themselves forsake food and water for most of the day as a type of remembrance. 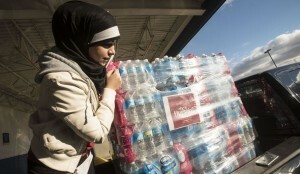 “Prophet Mohammed taught us ‘Your neighbor comes before your own household.’ As a resident of Detroit this is not only a Flint problem this is a Michigan problem and I feel obligated to help to the best of my ability.” said Mohammed Almawla, a local filmmaker and volunteer for the organization. Flint has been the site of growing issues with water contamination, after the Michigan Department of Environmental Quality (DEQ) allegedly ignored months of reports of water quality issues and fought with the Environmental Protection Agency (EPA) over water quality treatments. The EPA was also criticized for failing to prevent the problem. Another Michigan native and filmmaker, Michael Moore, called for the arrest of Gov. Rick Snyder. Mr. Moore also called for President Obama to visit Flint to survey the problem, criticizing the president if he failed to do so.